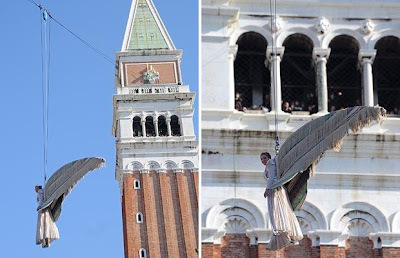 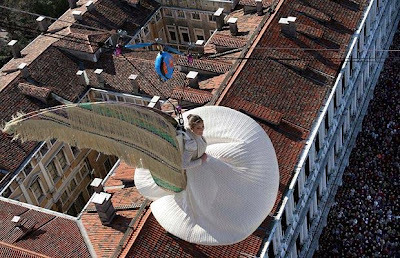 Margherita Missoni, the granddaughter of Rosita and Ottavio Missoni who started the Missoni knitwear company and fashion powerhouse in 1953, performs the traditional Flight of the Angel hanging from a cable tied from the bell tower at St Mark's Square . 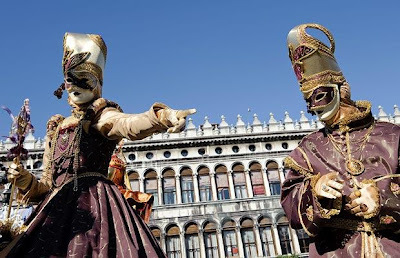 This centuries-old rite marks the official beginning of Venice's Carnival celebrations. 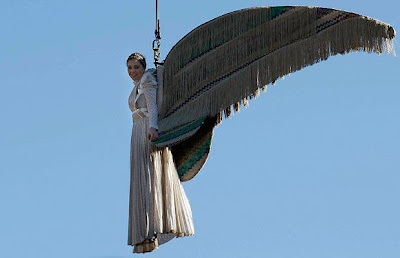 She wears a sequined white costume designed by her grandfather, fashion stylist Ottavio Missoni. 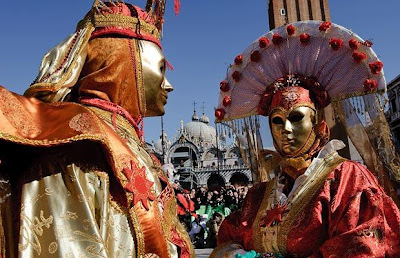 The Carnival is the largest and is considered the most important Venetian festival, attracting thousands of revellers from around the world each year. 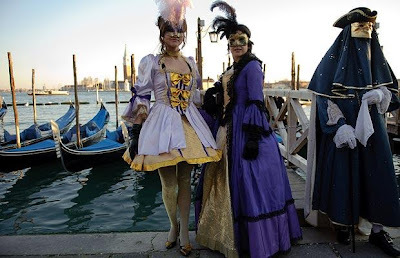 This year's Carnival will be held from February 13-24, under the name Sensation, Six Senses for Six Districts. 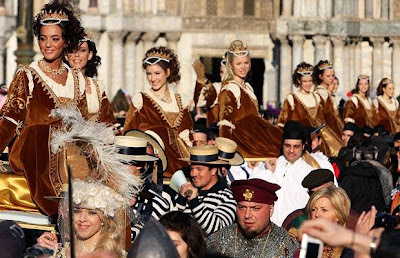 Women wearing historical costumes are carried through Saint Mark's Square in a procession called the Festa delle Marie, in memory of the liberation of young brides who were kidnapped and robbed of their jewels by Istrian pirates in 948 AD . 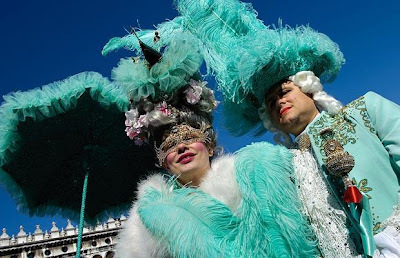 A woman dressed as Marie Antoinette poses in Saint Mark's Square . 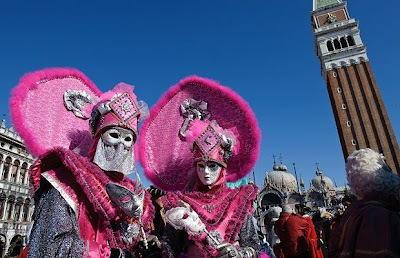 People in masks take part in carnival festivities under a bright blue sky . 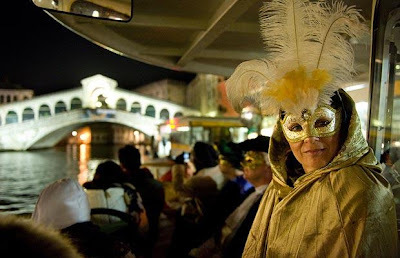 Costumed revellers arrive by gondola . 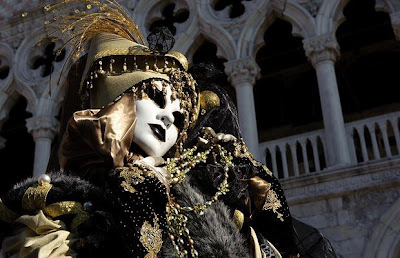 People wearing masks participate in carnival festivities outside the Doge's Palace . 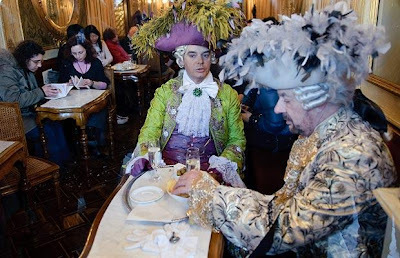 Costumed revellers have a snack in the famous Caffe Florian on Saint Mark's square . 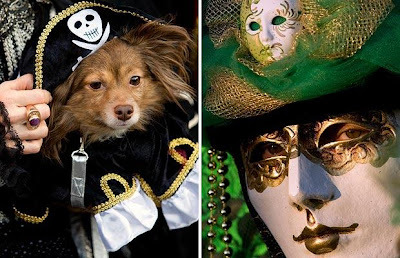 A reveller adjusts her dog's pirate hat, while another wears a typical Venice Carnival mask ..
Carnival-goers walk past the bell tower on Saint Mark's square ..
A woman wears a mask on a boat near the Rialto bridge ..